International Journal of Management and Development Studies, Online ISSN: 2320-0685, Print ISSN: 2321-1423 a refereed international journal, published quarterly by the GRABS Educational Charitable Trust. 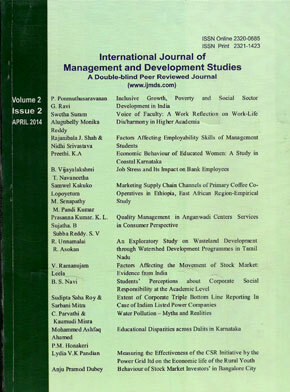 The journal started in 2012, publishes original research work, in the form of full length articles and reviews in the fields of management and development studies. The goal of the journal is to constitute a qualified and continual platform for sharing studies of academicians, researchers and practitioners.